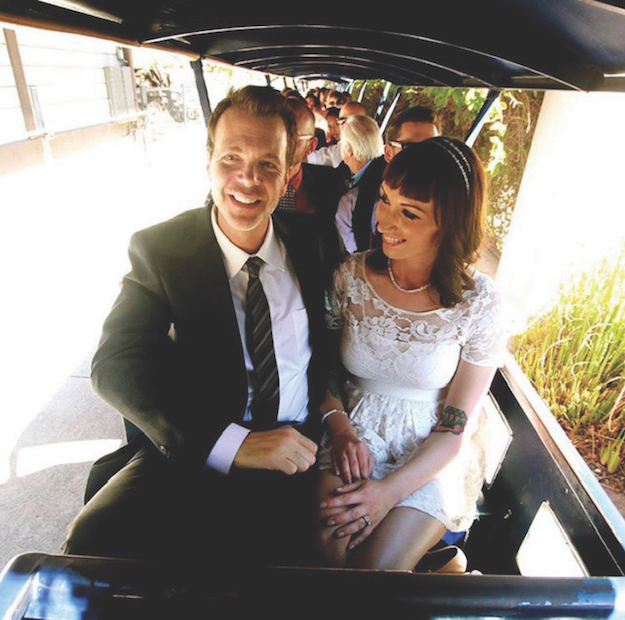 TRAVEL TOWN in Griffith Park was the scene of Leah and Matt Purse’s wedding. 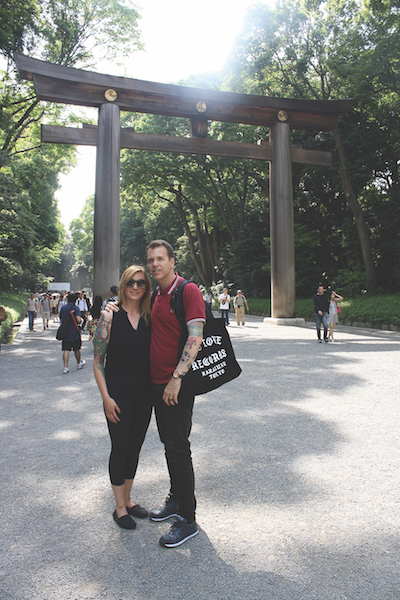 Leah met Matt Purse in 2011 while working as a barista at Peet’s Coffee in Larchmont Village. “He was a regular at the coffee shop and lived in the neighborhood, and I fell in love with him at first sight,” she tells us. Initial conversations over Matt’s “wonderful little English bulldog, Dougal,” (who has been featured in the Chronicle’s annual “Pets of Larchmont” section twice) revealed the barista and the regular had a lot in common. “We both enjoyed a very obscure and underground form of sound art called ‘noise,’ which seemed to encourage our first dates at music gear shops,” she said. A few years ago, the Rossmore Ave. couple started their own underground noise label, “and that’s taken over as my part time job,” said the former barista. With all the new coffee shops on the boulevard to choose from, Groundwork Coffee Co. is their latest caffeine beverage go-to. THE COUPLE VISITED Yoyogi Park in Tokyo, Japan, the Sutro Baths in San Francisco and boarded a sunset helicopter ride at Van Nuys Airport. They married in November 2013 at Travel Town in Griffith Park and had a month-long honeymoon in Thailand. “We love bulldogs, watching documentaries and movies in general, coffee, theme parks, traveling (especially to Japan), hiking, strolling around the Boulevard, Sawtelle Japantown or around Santa Monica Beach. “We’ve been married for five years now, and every day feels like Valentine’s Day!” Leah beams.